The Tolle Lege Institute exists to promote the study of Reformation history and theology. Our foundation was established in the US in 2007, and since 2016 it has also had a presence in Poland. Our primary mission is to disseminate and deepen knowledge about sixteenth- and seventeenth-century history, theology, culture and art of the Reformation, particularly the historic confessions of Reformed and Presbyterian churches. To accomplish this goal, we operate a reading room, a bookstore, and a publishing house. The Institute also organizes lectures, workshops, and academic conferences dedicated to the Reformation and Protestantism. The Tolle Lege Institute is overseen by a six-member Supervisory Board, comprising: Steven W. Auld, Paul Fields, Gordon S. Query, Michał Rogatko, David J. Van De Water and Kenneth B. Wingate. 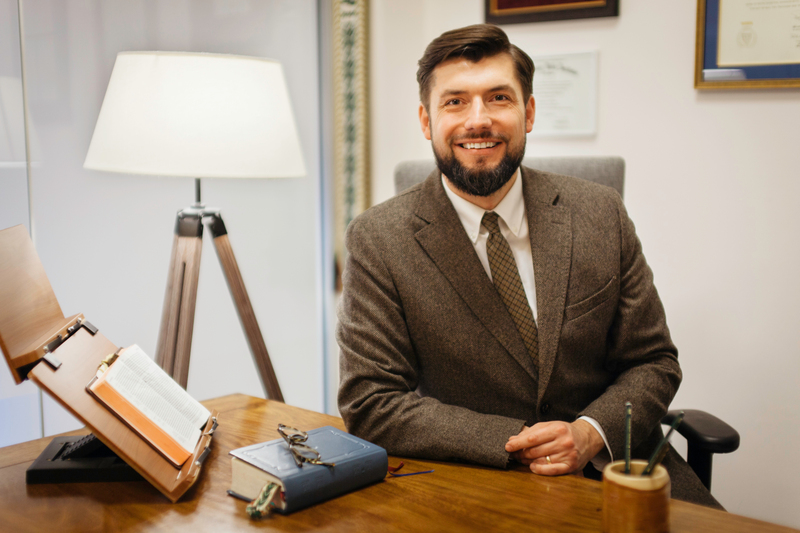 The president of the foundation is Dariusz M. Bryćko, PhD, a graduate of Calvin Theological Seminary and a pastor in the Associate Reformed Presbyterian Church. The organization was registered in Poland as an NGO in 2016. Tolle Lege Institute is a U.S. 501(c)(3) non-profit charitable organization, and all gifts are tax-deductible in the U.S.
Institute’s Study Center is based in Warsaw’s Praga-Południe district, near SWPS University and Soho Factory, and just 20 minutes from downtown Warsaw. The Mińska bus stop, located in front of the center, is served by lines 123, 173 and 202, and is three stops from Warsaw East Station (Dworzec Wschodni, ul. Lubelska side). The Gocławska and Praga Południe-Ratusz tram stops are a bit further away – just under 10 minutes’ walk – and are served by lines 3, 6, 22 and 26. As a research subject, for many years the Reformation was largely ignored by Polish academia. On the eve of the 500th anniversary of Martin Luther’s 95 Theses, we are seeing a revival of interest in the subject. The Tolle Lege Institute is seeking to address this growing interest by making available a broad range of Polish- and English-language materials that will be useful to researchers. Our collection of primary and secondary sources covers both the Reformation in the Polish-Lithuanian Commonwealth of the 16th-18th centuries – which was stronger than many today might suspect – and around the world. 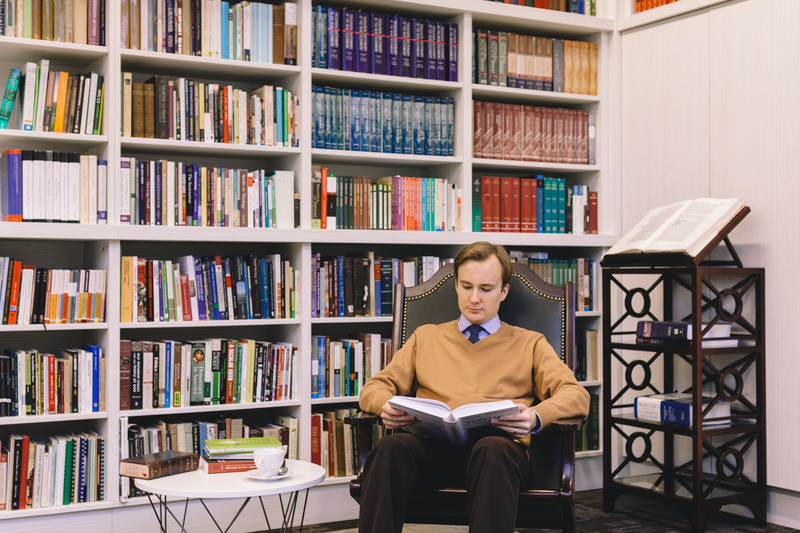 The institute also serves readers who are interested in exploring the rich heritage of Reformed spirituality and theology. Our exhaustive collection of the most important confessional documents and theological and devotional works allows our guests to encounter the spiritual world of the Reformation and the historic confessions that sprang from it. Visitors can also get to know the heritage of Protestant culture and art in the form of hymnals, catechetical materials, literature, poetry and classics of English-language writing. 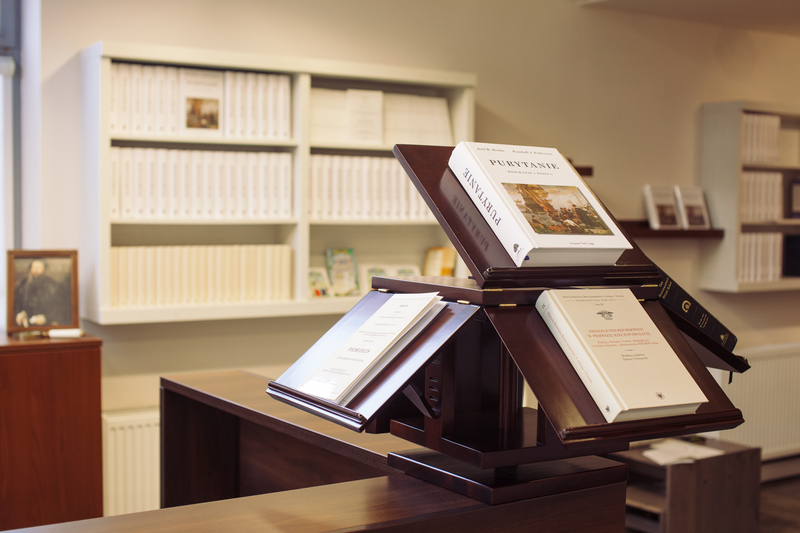 Our collection of print books comprises about 2,000 titles – important primary documents and classic secondary sources dealing with Reformed theology and history. The vast majority of these have been unknown or unavailable in Poland until now. Our catalogue is available on-line. The Institute has access to Logos Bible Software, with more than 2,500 resources – biblical tools and commentaries, sermon and Bible study preparation aids, and titles concerning theology and church history. Visitors can also explore more than 12,500 Puritan/Reformed resources (text and multimedia) available in the Puritan Hard Drive. Confessional Protestant theology: Systematic, historical, philosophical and moral theology; classic works and writings by contemporary Reformed theologians. The Reformers and church history: From the Early Fathers, through the writings and history of the European and Polish Reformation and Reformed confessions. Commentaries and Bible study tools: A broad collection of Protestant Bible commentaries and other exegetical and hermeneutical tools: dictionaries, concordances, atlases and online resources etc. Reformed spirituality: Devotional tracts, catechisms, hymnals, psalters, prayer books and other key texts of Protestant (particularly Reformed) culture. The reading room operates on the principle of open access: guests are free to browse our collection, and Institute staff will be glad to assist you with any questions. You are free to conduct research, use our photocopier and scanner and enjoy a cup of coffee or tea. Visitors to the center can also purchase books published by the Institute and by other select publishing houses. On-line bookstore will be available soon. The Institute publishes translations of Reformation classics. The Puritans is our first publication, presenting for a Polish audience the main figures of 16th-17th century Puritanism, their lives and most important works. The Tolle Lege Institute is doing important work in translating significant Reformed material into Polish. Poland produced notable Protestants at the time of the Reformation but has on the whole been dominated by Roman Catholicism now for many years. Tolle Lege are helping to address this theological imbalance and provide thoughtful Christians with excellent historic resources.